In all honesty, there is no way that spring is here or even on the horizon, although we had a terrible teasing of it this week. Sure the temperatures were in the 50s and even low 60s, but our March averages 10" of snow and I can't believe we'll get through the next 15 days without some. Nevertheless, we are all "posturing" for spring, regardless of our unspoken awareness that we're not even close! 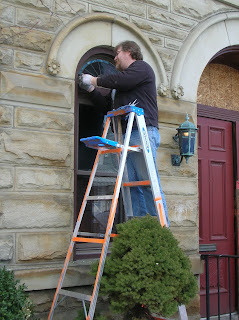 In town at the site of our first motherhouse, this week found local window restorers removing the three semi-circle stained-glass windows that are over the main door and side windows at the building's entrance. Most of the beautiful original windows that are still in the building are inside, protected from the elements and the "outside world." These three aren't and have developed some fine cracks and even a couple small holes. The restorers are confident that not only can they be restored, but they said that we will be surprised how close they'll be able to get to the original colors of the glass. And from our March Art Show, Stephanie Schmidt, OSB, found a rain-covered leaf and Bernadette Sullivan, OSB, a morning sunrise. Reflections of all eight south windows on ceramic tiles and on the floor. See our site for information on guest rooms and hermitages, retreats, Sunday liturgy and daily prayer, our ministries and other parts of our life as the Benedictine Sisters of Erie. I know you'll enjoy the blog being written by one of our scholastics, Sister Valerie Luckey. She is sharing her monastic journey through "Walking in the Holy Presence." You'll like these musings of a 20-something gal who works in one of our ministries and is also an oblate of the community. Our beautiful windows reflected in the Pyrex stands and in the mirrors on the floor. As Benedictine Sisters of Erie we commit ourselves to be a healing presence and prophetic witness for peace by working for sustainability and justice, especially for women and children. 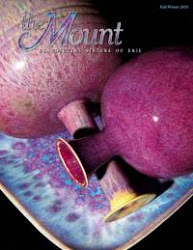 Mount St. Benedict in spring. Joan Chittister's column "From Where I Stand" in NCR.